Two men smashed the front glass of the Louis Vuitton store on the Magnificent Mile during an attempted burglary, police said. 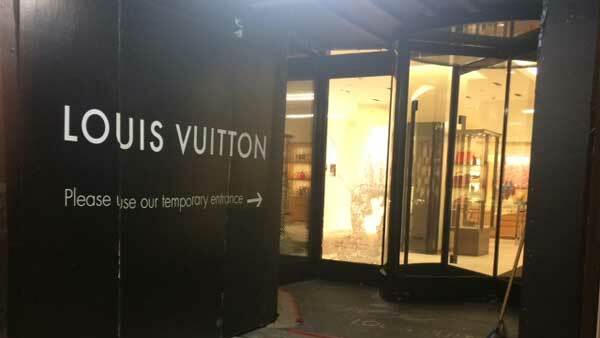 CHICAGO (WLS) -- Two men smashed the front glass of the Louis Vuitton store on the Magnificent Mile during an attempted burglary, police said. Investigators said the men broke the glass next to the revolving door of the store in the 900-block of North Michigan Avenue around 4:40 a.m. Tuesday. But they never got in. Officers guarded the store while investigators determined whether anything was taken. Nothing was stolen. Sources close to the investigation said the two men were reportedly wearing hooded sweatshirts and used a sledgehammer.